Former governor of Delta State, Chief James Onanefe Ibori, on Wednesday, paid a condolence visit to the family of his long time friend and political ally, late D.S.P Alamieyeseigha in Amassoma, Bayelsa State. Ibori said he was devastated ‎when news of his death got to him in the United Kingdom as they both shared a common ideology and relationship which was very deep and added that Alamieyeseigha until his demise fought against oppression and evil which ultimately led to his untimely death. While sympathising with the family of the departed Governor-General of the Ijaw Nation, the former governor urged them to take solace in the fact that he was a good man who will forever be remembered by his legacies and also the reality that what he believed in will not die. The former Delta State Governor who equally took time to visit the grave side of the departed Alamieyeseigha assured the family that he will always remember and stand by them as their father and son would have done same for his family. 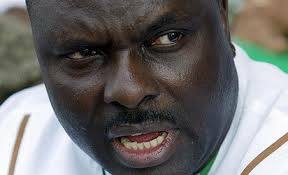 Earlier, Ibori had visited Governor Seriake Dickson at the Government House, in Yenagoa where he also expressed his sympathy to the government and people of the state over the death of their first civilian governor. According to him the visit was to appreciate Governor Dickson for immortalizing ‎the foremost Ijaw hero by renaming the Government House banquet hall after him and for pushing forward his noble ideas of governance and strong agitation for rights of people Ijaw and Niger Delta. ” I take solace in the fact that having met you, I am encouraged that indeed the flag only flew half mast for a couple of days and after that the flag is flying again. Thank you for playing your bit to immortalize him. He may have left us but his spirit is still with us”. In his remarks, Governor Dickson said the visit was solemn but historic and thanked Ibori for his thoughtfulness to visit the family which emphasized the brotherliness that existed between him and the late former governor. Dickson who called on people of the Niger Delta to stop betraying their leaders noted that both Alamieyeseigha and Ibori were victims of the Niger Delta struggle which was as a result of their campaign for resource control and fiscal federalism. He said “‎ We have done enough when it comes to betraying, sabotaging and pulling down one another especially our leaders. Nobody in this nation will build and sustain leaders for us, we have to build our leaders, support and encourage them. So I think the time has come for us in the Niger Delta to turn a new leaf and learn from others”.